Can big data, artificial intelligence, the might of the world’s biggest company you’ve never heard of and the agility of China’s #1 SaaS (Software-as-a-Service) cloud innovator in smart grid, together solve the high-value structural problem of power grid imbalance unique to China and bring back blue skies? China’s main coal deposits are in the north, its main solar, wind and hydropower potential in the northwest and far west, and its swelling energy demand is concentrated in the coast’s congested eastern grids with continuing urbanization and aggressive promotion of electric vehicles and buses (EV) adding significant load to the electricity grid. China is the world’s largest consumer of electricity, and its demand is expected to at least double by 2035. However, China is struggling to efficiently balance its power production and demand, and to distribute electricity where and when it is needed. The utilization of ultra-high-voltage (UHV) power transmission lines, designed for long-distance transmission to send excess intermittent electricity in remote interior regions to coastal centres battling worsening air pollution, has been far lower than expected. China’s rates of renewable energy curtailment — the term for when plants are deliberately throttled or shut down due to grid capacity limits or to simply make room for coal-fired generation — are the highest in the world and getting higher. Part of the problem is that it’s easier and more lucrative to use predictable sources like coal which provide a constant stream of electricity, than the variable generation from renewables. China’s grid system is run by the State Grid Corporation of China (SGCC) and China Southern Power Grid Co (CSG). State Grid is probably the biggest company you’ve never heard of, with nearly 1 million employees and 1.1 billion customers. Last year, it reported $9.5 billion in profits on $349 billion in revenue, making it the second-largest company on Fortune’s Global 500 list, just behind Wal-Mart. State Grid is already the biggest power distributor in Brazil, where it built its first (and still only) overseas UHV line. State Grid has also snapped up stakes in national transmission companies in Australia, Greece, Italy, the Philippines, and Portugal. To solve the grid imbalance problem, the state undertook a monumental energy market reform to gradually liberalize the electricity distribution business and marketize electricity price transactions which started in 2015 and has accelerated in 2018 and over 7,000 electricity power sales companies with trading qualifications have been established. Whether it is a pure electricity sales company or a power distribution company or an industrial park, whether the volume is large or small, they all need information system support. This week, we highlight the under-the-radar listed Asian exponential innovator Forever Technology 恒华科技 (SZSE: 300365) who is China’s #1 software leader in grid design, grid infrastructure project management and grid distribution. The energy market reform has propelled growth in Forever’s grid distribution software business to jump 305.7% yoy in its 1H FY2018 results and now contribute 43.1% of its sales. In its grid distribution software business, Forever has built China’s only online integrated marketplace platform “Power+” (https://www.365power.cn) to serve local power companies, power distribution companies, smart industrial parks, and energy-using enterprises to buy/sell electricity with various SaaS products to effectively support the power distribution customers in electricity purchase, electricity sales, development of the core business of the power distribution business and value-added services in big data analytics services. For instance, Forever’s electricity sales big data forecasting platform product achieves real-time prediction within 3 seconds, and the power consumption prediction accuracy rate is over 97%, which has been verified by real data of millions of users in Guizhou, Shanxi, Zhejiang, Qinghai and other provinces. Based on the artificial intelligence machine learning algorithm and multi-factor analysis of user industry, type, holiday, business status, etc, the predictive model continuously self-improves and corrects based on historical data and future trends, dynamically adjusts the predicted algorithm parameters, and realizes self-evolution. The big data SaaS product achieves complete data governance and has complete automated data management capabilities, and automatically repairs the abnormal data and error data of electricity sales according to the rules and trends of electricity consumption, and provides external data sources such as weather, regional economic indicators, and enterprises. The SaaS product has build a library with more than 30 kinds of electricity sales forecasting algorithms and models with independent intellectual property rights, in addition to typical time series method, periodic coefficient method, cubic exponential smoothing, gray forecasting method, auto-regressive differential moving average method, holiday analysis and forecasting algorithm, etc. Like Adobe who was misunderstood back in 2011 when it outlined its transition from package software to a subscription-based SaaS business model before compounding over 850% to US$127bn in market value, Forever is in the early tipping point stage of transforming from its original smart grid life cycle informationization project service business model 2-3 years ago to presently provide standardized SaaS cloud software products that generate healthy profit margins and growth. On 28 Feb 2019, Forever announced its preliminary estimated FY2018 results in which sales increased 38.35% yoy to RMB1.184bn, operating profit increased 42.1% yoy to RMB 298.7m, and net profit rose 41.3% yoy to RMB 271.63m, with OP margin of 25.2%, ROE (= EBIT/Equity) of 16.4% and ROA of 12%. Balance sheet is relatively healthy with net cash of RMB 505m (US$75.4m) (RMB 641.26m gross cash, RMB 136.1m gross debt) which is around 4.5% of market cap. Forever is up over 250% in share price performance since its Jan 2014 IPO to a market value of US$1.6bn, as compared to a 25% for the Shenzhen composite index over the same period. Forever also reminds us of ASX-listed Altium, the global enterprise SaaS leader in electronics design systems for 3D PCB design and embedded system development, the equivalent in PCB design to what Adobe Photoshop is for picture editing. Since Altium made the difficult and painful transformation from conventional software to SaaS from Oct 2012 led by CEO Aram Mirkazemi, its share price had compounded over 38-fold to a market value of US$3.2bn. In grid design software, Forever commands an over 80% domestic market leadership in 3D-GIS-BIM (Geographic Information System-Building Information Modeling) design of power transmission line, power substation and power cable. The shift to a unique collaborative design cloud platform with various design tools and Slack-like collaborative project management and real-time communication mobile app “Yao Zhi” 遥知 (http://yz.365power.cn) to help achieve cross-regional, cross-professional and cross-tool collaboration design have further enhanced the value-add to its community of customers and solve the high-value problem of the uneven distribution of software design and software engineering resources in the industry. Forever also benefits from new state regulation mandating the use of 3D design software from 1 Feb 2019 for smart grid construction to build a full-service data link and improve the overall design quality of power transmission and transformation projects, which will greatly increase the penetration rate of 3D design software. (1) Grid Design (30.6% of sales in 1H FY2018, GP margin 52.5%, sales growth 41.6% yoy), in which its wholly-owned Daoheng Technology 道亨科技 (http://www.slcad.com) commands an over 80% market leadership in 3D-GIS-BIM design of power transmission line, power substation and power cable. The online design institute SaaS products were launched in May 2018. 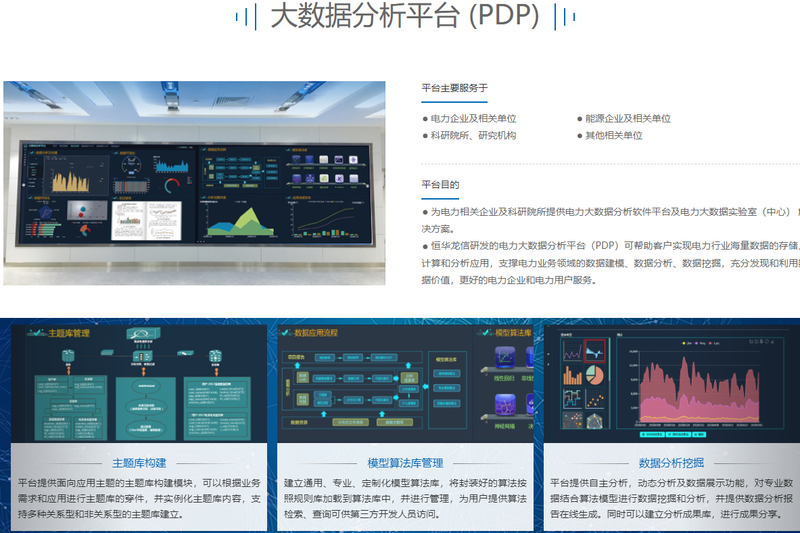 The professional design cloud platform community E-Zhilian E智联, established in collaboration with China Electric Power Development Research Institute, was put into operation in June 2018 for surveying and design enterprise managers, design and technical talents, project owners, material equipment manufacturers, software companies and other vertical practitioners and integrated with the Power+ supply chain cloud platform (https://sj.365power.cn). (2) Grid Infrastructure Project Management (22.9% of sales, GP margin 29.1%, sales growth -21.6% yoy). Forever modernizes infrastructure management information software with its enterprise information integrated service platform (EISP) to serve power infrastructure construction enterprises, local power companies and distribution power companies, and provides infrastructure site management, process management and control services for the construction of integrated energy and power grids, and plans to establish a infrastructure management cloud community. Forever’s “smart site” 智慧工地 SaaS products (https://www.365power.cn/view/mall/wisdom-site.html) was launched in June 2018 and the infrastructure management community will be integrated into its Power+ cloud platform. The community is also the gateway for infrastructure management SaaS products. (IV) value-added services in the energy big data service platform that provides optimized power policy services, intelligent energy-saving services, electricity diagnostic services, optimize demand response, enterprise user credit information services, energy Internet, e-commerce, as well as providing power companies with demand side data and user consumption behavior analysis. Power+ also attracts and supports industry users through industry information and Reddit-Zhihu-like online expert Q&A community to support the upstream and downstream suppliers in the industry. Forever’s big data analysis platform (https://www.365power.cn/view/mall/bigdata.html) helps customers realize the storage, calculation and analysis applications of massive data in the power industry, supports data modeling, data analysis and data mining in the power business field, and fully discovers and utilizes data values to better serve power companies and power users. The platform has been successfully put into operation in power companies, and has realized big data applications in the fields of power marketing, electric vehicles, coal-to-electricity, power consumption information collection, and power credit reporting. Forever also partnered with credit reporting giant Experian (LON: EXPN) to develop a online credit verification service 企业征信 (https://c.zhaobiao666.com) with professional tools to help procurement managers, bid evaluation experts, discipline inspection and supervision personnel to evaluate the creditworthiness of suppliers before the opening bid through Credit China reports, industry violations reports, suspected rigging of bids, etc. and reduce at least 80% of the workload in the credit verification of suppliers, thus improving the efficiency of bid evaluation. Thus, with the advancement of the power system market-oriented reform, the market for distributing electricity has gradually been liberalized with over 7,000 electricity power sales companies established throughout the country. Two cross-regional trading centers in Beijing and Guangzhou and 33 provincial-level power trading centers have been unveiled; 30 provinces including Guizhou, Anhui, Shandong, Zhejiang, and Liaoning have approved transmission and distribution prices; Guangdong and Guangxi Yunnan, Hebei, Anhui, Shanxi, Shandong, Guizhou, Jiangxi have all carried out electricity transactions involving the participation of electricity sales companies. In the spot market, in 2017, China identified the first batch of pilot projects for the construction of electric power spot market in eight regions, starting in Guangdong, Mengxi, Zhejiang, Shanxi, Shandong, Fujian, Sichuan and Gansu. Among them, the Guangdong power spot market has entered the simulation test operation in August 2018. On 27 Dec 2018, the State Grid started the trial operation of the power spot market in Gansu and Shanxi for the first time, which marked a major breakthrough in China’s first batch of power spot market. This year in 2019, Zhejiang, Fujian, Shandong, and Sichuan have also completed the preparation of the spot market construction plan, and are working on the preparation of the rules according to the plan of the local government’s power authority before the end of June 2019. This means that at least 7 provinces in China in June 2019 have the test conditions for power spot trading. Forever’s cloud sales platform has accurately matched the individualization requirements of the settlement system and transaction rules of all provinces in the country. When the sales company settles the income, it will automatically match the province’s transaction rules and electricity prices, and predict different scenarios according to the contractual agreement and power consumption. The income situation under the electricity distribution plan guides the enterprise to achieve the optimal business plan. Forever’s customers have expanded from the two major power grid companies (State Grid Corp and China Southern Power Grid) and power design institutes to local power companies, distribution power companies, smart industrial parks, and energy-using enterprises. Many smaller-scale power sales companies have weak IT systems and require Forever’s SaaS products to conduct business smoothly and effectively. The more downstream users there are, the greater the demand for Forever’s SaaS solutions. As at 1H FY2018, the number of registered users of the cloud service platform was 59,000 (up from 10,000 in 2015), of which 4,700 were enterprise users and 54,300 were individual users. Forever’s top five customers contribute 36.26% of sales and top five suppliers account for 21.78% of COGS. On 8 March 2019, State Grid released the monumental “Ubiquitous Power Internet of Things Construction Outline” 《泛在电力物联网建设大纲》and announced the multi-billion construction of the “Ubiquitous Power IoT” 泛在电力物联网 by 2024. The strong smart grid with UHV as the backbone is the “skeletal muscle” and the Ubiquitous Power IoT is the “neural network”, which refers to all aspects of the power system fully utilizing modern information technologies such as mobile internet, big data, cloud computing, artificial intelligence, and advanced communication technologies to realize the interconnection of all aspects of the power system. A widely interconnected, coordinated and interactive energy Internet is inseparable from the investment of grid information technology which also provide a broad platform for the company’s smart grid SaaS products and services. Forever also combines its online services with its offline technical services to build an EPC management cloud platform to provide management services to manage the execution of the entire EPC project, providing construction management services for the owners, and realizes the built-in functions of the grid company’s internal management company, thereby improving the efficiency of EPC project execution and reducing the cost of execution of the EPC project. These comprehensive offline integrated technical services include engineering design consultation, training, operation and maintenance monitoring, infrastructure management, energy efficiency services. Thus, Forever becomes the internal management company of local power companies and power distribution companies who do not have the ability to set up a management company like a power grid company due to limited technical resources. Forever has a small “Others” business that account for 3.4% of 1H FY2018 sales, 2.7% of GP with GP margin of 28.5%. This comprises of: (1) Water resources and hydropower ICT solutions such as flood monitoring and early warning system. dam and bridge monitoring, drone/UAV (unmanned aerial vehicle) emergency command and dispatch system; (2) Smart transport system in highway offsite overweight enforcement system, cloud-based overweight and oversized vehicle detecting system, bridge health monitoring vehicle axle load monitoring system, and (3) Overseas business. While there is some niche competitiveness in the water resources and hydropower ICT solution and smart transport system business (overweight detection vehicle system), we dislike this distraction to its core software business for smart grid and we think Forever should divest this “Others” business over time to focus on its core business. During the ongoing transformation process to the SaaS business model, Forever remains exposed to seasonal factors of customer demand since there is a strong seasonality in the practices of its main customers who are power grid companies and related enterprises. They face increasingly stricter procedures for project budget approval and fund use, and the corresponding payment cycle is longer. In the first quarter of each year, the power system conducts pre-qualification and bidding for the grid software; in the second quarter, technical consultations are initiated and the implementation projects are initiated; the third and fourth quarters are the peak period for centralized procurement and demand supply in the power grid industry. As a result, while the customers have good reputation, Forever’s sales and profits are weighted towards the second half of the year. The estimated FY2018 overall accounts receivables period is around 250-260 days and total receivables period is around 350-360 days. For large-scale accounts receivable, Forever has developed relevant implementation plans, including regular summary analysis to ensure that each receivable has tracking and feedback. Inventory period is around 60-66 days. Forever’s operating cashflow is generally negative in the first half of the financial year before turning more positive towards the second half. In the future, Forever’s expects that its revenue will be changed from low-frequency large orders to high-frequency recurring sales. Overall, Forever’s products and services are deployed in multiple parts of the smart grid, with a wide range of downstream customers and has unique competitiveness in the industry. Forever had also won the “Most Influential Software and Information Service Enterprise in China in 2017” with its deep efforts in the field of smart grid informationization. Forever was founded on 23 Nov 2000 by Jiang Chunhua 江春华, Fang Wen 方文, Luo Xinwei 罗新伟, Chen Xianlong 陈显龙 who collectively owns 54.26% of the company. The four key management personnel have pledged 30.5% of the shares, mainly to finance the subscription into the non-public offering of new shares back in Sept 2015 which raised RMB 750m. Most of the company’s senior management and core business leaders hold company shares, maintaining the stability of the company’s management and core technical team. 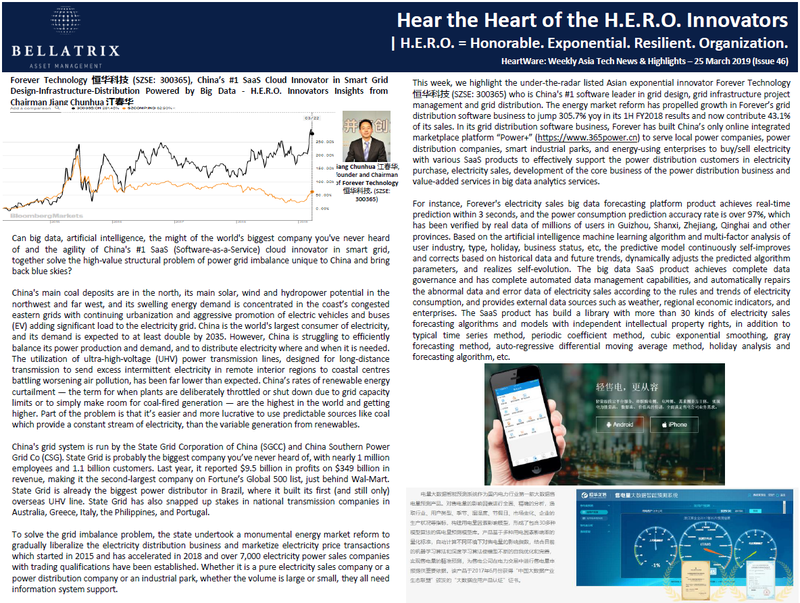 Thus far, of the 66 entrepreneurs and CEOs whom we had highlighted in our weekly research brief HeartWare, around one-third are in our focused portfolio of 40 HERO Innovators, while the rest are in our broader watchlist of 200+ stocks. Our emotional labor of love over the past months in sharing openly our research ideas (to battle-test our ideas by critiques and avoid blindspots in investing) and setting up the proper regulated and transparent UCITS fund structure to protect investors’ interests has deepened our conviction for the positive change that we will make together with H.E.R.O. – and we are now in the final stage of giving birth at end March/April 2019 to H.E.R.O., the only Asia SMID-cap tech-focused fund in the industry and guarding investors’ interests in the regulated UCITS fund structure with daily NAV & daily liquidity and no exit fees. To our interested clients who have been asking, we sincerely apologize for the prolonged labor in the birth of HERO over the past months as we have been preparing for a coordinated delivery of our whole family of Swiss fund series at end March and HERO will also be invigorated with the healthy seed from farsighted committed long-term institutional clients to journey far to compound value for investors. Do watch out in the coming weeks for our press release on the birth and launch of H.E.R.O. “The Power+ cloud platform’s integrated and professional information services for the entire life cycle of the power grid and has layouts in grid design, grid infrastructure management, grid operation and maintenance, and grid distribution for electricity selling companies, power grid owners, survey and design teams, construction companies, software suppliers, data suppliers, equipment and materials suppliers and crowdsourcing users. Different from the general provider that can only provide single or several services, the whole one-stop service greatly improves the service level of Forever’s grid design, grid infrastructure management and grid distribution services, and reduces the time and capital cost for customers to purchase multiple services. Our cloud platform has achieved healthy expansion. The number of registered users of the cloud service platform has increased from 10,000 at the end of 2015 to over 59,000 as at 1H FY2018, of which 4,700 were enterprise users and 54,300 were individual users,” comments Jiang Chunhua 江春华, founder and Chairman of Forever Technology 恒华科技 (SZSE: 300365). Forever is China’s leading SaaS cloud innovator in Smart Grid Design-Infrastructure Management-Distribution powered by big data to solve the high-value structural problem of power grid imbalance unique to China since its main coal deposits are in the north, its main solar, wind and hydropower potential in the northwest and far west, and swelling energy demand is concentrated in the coast’s congested eastern grids with continuing urbanization and aggressive promotion of electric vehicles and buses (EV) adding significant load to the electricity grid. China is the world’s largest consumer of electricity, and its demand is expected to at least double by 2035. However, China is struggling to efficiently balance its power production and demand, and to distribute electricity where and when it is needed. The utilization of ultra-high-voltage (UHV) power transmission lines, designed for long-distance transmission to send excess intermittent electricity in remote interior regions to coastal centres battling worsening air pollution, has been far lower than expected. China’s rates of renewable energy curtailment — the term for when plants are deliberately throttled or shut down due to grid capacity limits or to simply make room for coal-fired generation — are the highest in the world and getting higher. Part of the problem is that it’s easier and more lucrative to use predictable sources like coal which provide a constant stream of electricity, than the variable generation from renewables. To solve the grid imbalance problem, the state undertook a monumental energy market reform to gradually liberalize the electricity distribution business and marketize electricity price transactions which started in 2015 and has accelerated in 2018 and over 7,000 electricity power sales companies with trading qualifications have been established. Whether it is a pure electricity sales company or a power distribution company, whether the volume is large or small, they all need information system support. 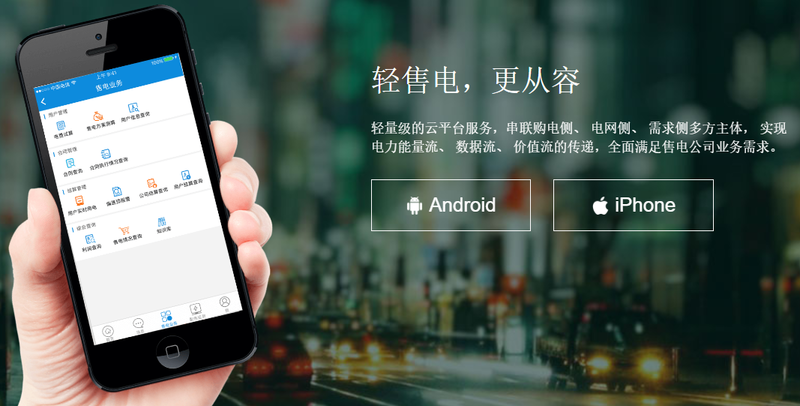 Forever has built China’s only online integrated marketplace platform “Power+” (https://www.365power.cn) to serve local power companies, power distribution companies, smart industrial parks, and energy-using enterprises to buy/sell electricity with various SaaS products to effectively support the power distribution customers in electricity purchase, electricity sales, development of the core business of the power distribution business and value-added services in big data analytics services. Growth in Forever’s grid distribution software business has jumped 305.7% yoy in its 1H FY2018 results and now contribute 43.1% of its sales. (1) Grid Design (30.6% of sales in 1H FY2018, GP margin 52.5%, sales growth 41.6% yoy), in which its wholly-owned Daoheng Technology 道亨科技 (http://www.slcad.com) commands an over 80% market leadership in 3D-GIS-BIM (Geographic Information System-Building Information Modeling) design of power transmission line, power substation and power cable. The shift to a unique collaborative design cloud platform with various design tools and Slack-like collaborative mobile app “Yao Zhi” to help achieve cross-regional, cross-professional and cross-tool collaboration design have further enhanced the value-add to its community of customers and solve the high-value problem of the uneven distribution of software design and software engineering resources. The online design institute SaaS products were launched in May 2018. The professional design cloud platform community E-Zhilian E智联, established in collaboration with China Electric Power Development Research Institute, was put into operation in June 2018 for surveying and design enterprise managers, design and technical talents, project owners, material equipment manufacturers, software companies and other vertical practitioners and integrated with the Power+ supply chain cloud platform (https://sj.365power.cn). Forever also benefits from new state regulation mandating the use of 3D design software from 1 Feb 2019 for smart grid construction to build a full-service data link and improve the overall design quality of power transmission and transformation projects, which will greatly increase the penetration rate of 3D design software. Forever also partnered with credit reporting giant Experian to develop a online credit verification service 企业征信 (https://c.zhaobiao666.com) with professional tools to help procurement managers, bid evaluation experts, discipline inspection and supervision personnel to evaluate the creditworthiness of suppliers before the opening bid through Credit China reports, industry violations reports, suspected rigging of bids, etc. and reduce at least 80% of the workload in the credit verification of suppliers, thus improving the efficiency of bid evaluation. Thus, with the advancement of the power system market-oriented reform, the market for distributing electricity has gradually been liberalized with over 7,000 electricity power sales companies established throughout the country. Two cross-regional trading centers in Beijing and Guangzhou and 33 provincial-level power trading centers have been unveiled; 30 provinces including Guizhou, Anhui, Shandong, Zhejiang, and Liaoning have approved transmission and distribution prices; Guangdong and Guangxi Yunnan, Hebei, Anhui, Shanxi, Shandong, Guizhou, Jiangxi have all carried out electricity transactions involving the participation of electricity sales companies. In the spot market, in 2017, China identified the first batch of pilot projects for the construction of electric power spot market in eight regions, starting in Guangdong, Mengxi, Zhejiang, Shanxi, Shandong, Fujian, Sichuan and Gansu. Among them, the Guangdong power spot market has entered the simulation test operation in August 2018. On 27 Dec 2018, the State Grid started the trial operation of the power spot market in Gansu and Shanxi for the first time, which marked a major breakthrough in China’s first batch of power spot market. This year in 2019, Zhejiang, Fujian, Shandong, and Sichuan have also completed the preparation of the spot market construction plan, and are working on the preparation of the rules according to the plan of the local government’s power authority before the end of June 2019. This means that at least 7 provinces in China in June 2019 have the test conditions for power spot trading. Forever’s cloud sales platform has accurately matched the individualization requirements of the settlement system and transaction rules of all provinces in the country. When the sales company settles the income, it will automatically match the province’s transaction rules and electricity prices, and predict different scenarios according to the contractual agreement and power consumption. The income situation under the electricity distribution plan guides the enterprise to achieve the optimal business plan. Overall, Forever’s products and services are deployed in multiple parts of the smart grid, with a wide range of downstream customers and has unique competitiveness in the industry. Forever had also won the “Most Influential Software and Information Service Enterprise in China in 2017” with its deep efforts in the field of smart grid informationization. Forever competes with SAP and Neusoft (SHSE: 600718) of which the power grid software business is a very small part of its business compared to its main products and services in the medical field. On 28 Feb 2019, Forever announced its preliminary estimated FY2018 results in which sales increased 38.35% yoy to RMB1.184bn, operating profit increased 42.1% yoy to RMB 298.7m, and net profit rose 41.3% yoy to RMB 271.63m, with OP margin of 25.2%, ROE (= EBIT/Equity) of 16.4% and ROA of 12%. Balance sheet is relatively healthy with net cash of RMB 505m (US$75.4m) (RMB 641.26m gross cash, RMB 136.1m gross debt) which is around 4.5% of market cap. Forever is up over 250% in share price performance since its Jan 2014 IPO to a market value of US$1.6bn, as compared to a 25% for the Shenzhen composite index over the same period. Forever was founded on 23 Nov 2000 by Jiang Chunhua 江春华, Fang Wen 方文, Luo Xinwei 罗新伟, Chen Xianlong 陈显龙 who collectively owns 54.26% of the company. The four key management personnel have pledged 30.5% of the shares, mainly to finance the subscription into the non-public offering of new shares back in Sept 2015 which raised RMB 750m. Most of the company’s senior management and core business leaders hold company shares, maintaining the stability of the company’s management and core technical team. “Forever has experienced three stages. (1) In the initial stage, Forever’s management rely on years of work experience in the power industry to take the lead in proposing the concept of integration of the entire life cycle of the power grid and grid information, and we are committed to the information support for the planning, design, infrastructure, and operation & maintenance for grid enterprises..
(2) During our growth period, based on our integrated life cycle informationization concept, we increase the R&D investment of our core technology systems and enhance the technological competitive advantage, and gradually grow into a smart grid information technology leader. We were listed on the Shenzhen Exchange in Jan 2014. (3) At this stage, riding on the government support of the national power reform and the Internet+ layout, Forever has created a Internet+ service-oriented SaaS business model for the power industry. Through the self-developed cloud service platform Power+ connected to the upstream and downstream of the industry chain, and the cloud service product system such as power grid design cloud, EPC cloud, operation and maintenance cloud, we have established an Internet ecosystem for the power industry. “State Grid was involved in a multi-phase smart-grid project for China’s electrical grid planned for 2011-2015. China’s smart grid efforts are different from those in the US in that its plans heavily use ultra high voltage (UHV) lines. China is the first and still the only nation with the stated ambition of using UHV power lines as the ‘core’ to inter-connect its regional power grid networks into a ‘strong and smart’ national network. State Grid and China Southern Power Grid Corporation are committed to solving the problem of inadequate power grid imbalance through the planning and construction of smart grids, and strives to build a new generation of power system that is safe, green, efficient and intelligent, and promote the flexible access of various energy production and consumption entities. A strong smart grid with UHV is the backbone network. “Forever’s collaborative design cloud platform provides design tools and application services, spatial database, mass data processing and big data analysis services, cross-disciplinary collaborative design, informatization management and 3D digital design technology for intelligent, effective and accurate power design in power grid design work for both transmission and distribution networks for electrical designers and engineers. Users include designers in State Nuclear Electric Power Planning, Design & Research Institute, State Power Grid Beijing Economic & Technological Research Institute, etc. (1) Digital design of power transmission project. Forever integrates 3D technology, GIS technology, geographic positioning data, thematic data, intersections data and other data services to support power distribution digital design in digital line selection, 3D tower positioning, spatial electric devices analysis (including spatial 3D algorithms to solve complicated spatial electric devices calculation and verification to increase design precision), 3D tower structure design; and fulfill different phases of design requirements, such as transmission lines route feasibility report, preliminary feasibility study, preliminary design, construction design drawing, etc. (I) In transmission line design system, Forever utilizes precise and complete data about power grid state, 2D and 3D topographic and geomorphic conditions plus various design resources to enable engineers to quickly and accurately design lines, select conductors, arrange poles or towers. It also allows 2D or 3D display of design results, automated matching of accessories for poles or towers, materials statistics, simulated calibrating of design results and selection of substation location. Thus it accelerates the designing process and improves design quality while relieving designer’s workload. Through calculation of factors like design standards geographical and meteorological conditions, it is able to determine the number and models of necessary communication, measurement or monitoring devices. Those devices provide functions like sensing, data transmission and alarming. Thus, Internet of Things is actually implemented in the first stage of power grid full lifecycle management. (II) In distribution line design system, it is a fully integrated design tool including three modules: overhead transmission line design, cable design, switching room (substations) design. It performs project management, graphic plotting, equipment model selection, optical arrangement and project costs calculation. It helps designers adhere to design standards, improve their work efficiency, and unify construction norms and equipment specifications. It standardizes the process of power grid planning and design. Digital design results could be transferred to the other systems. It enables seamless integration with the next construction system. Furthermore, it is the precondition for data utilization in the process of operation, maintenance and marketing. (2) Collaborative management of design project. Forever provides power grid design project management through all phases of the project, from the starting of the project, obtaining of the assignment order book, collaborative design to results inspection to realize cross-disciplinary collaboration and digitization of design data management and network sharing. (1) Distribution network construction planning: This covers the whole process of project construction management and control, which includes feasibility study, preliminary establishment, preparation for start-up, construction, commissioning, acceptance, commissioning and post-evaluation. It needs quality, schedule, safety, technology and cost management and control. (2) Production, operation and maintenance: It is necessary to integrate and manage all power distribution equipment assets to ensure their normal operation and data monitoring. (3) Distribution network scheduling: This involves scheduling, data monitoring and forecasting, and operational evaluation, with particular emphasis on accurate management and analysis of data. (4) Purchase and sale of electricity: This includes all business activities of pure electricity sales companies, from user mining, contract signing, market-based transaction purchase, deviation assessment to power settlement, customer service, and continuous marketing, all of which are key to profitability. (1) Contract design and management: Provides the power company with the data analysis and forecasting function before the formal signing of the power sales contract, supports multiple user signing methods, customizes the settlement method, assists in contract management, purchase and sale management, electricity usage contract management, settlement management, parameter configuration, predicting the various contract benefits. It can also be converted to a formal contract with one click. (2) Proactive deviation early warning mechanism: Manages the user power consumption plan, reports the real-time power consumption data through the demand side power collection platform or the user mobile phone app. The power deviation warning is used to remind users to use electricity reasonably and avoid the risk of assessment, enhance the actual operation ability of the electricity sales company’s purchase and sale of electricity, and help enterprises avoid operational risks and enhance customer service experience. (3) Rights management: Realizes unified management of multi-system and full-stage user rights. It can flexibly configure organizational structure, user roles, menu resources through the fully visualized operation interface, and can filter business data according to the user’s unit and authority to achieve clear rights and responsibilities, and standardize business processes. (5) Real-time data monitoring, load curve forecasting, electricity price forecasting, smart power distribution, and intelligent trading, real-time and other different periods of centralized bidding, listing transactions, bilateral negotiations, contract transfer and other trading mode needs. (6) The cloud sales platform will realize information interaction, data sharing and seamless integration with products such as power distribution monitoring platform, comprehensive energy efficiency analysis platform and intelligent operation and maintenance dispatch management platform. “The electricity sales big data forecasting platform product achieves real-time prediction within 3 seconds, and the power consumption prediction accuracy rate is over 97%, which has been verified by real data of millions of users in Guizhou, Shanxi, Zhejiang, Qinghai and other provinces. Based on the artificial intelligence machine learning algorithm and multi-factor analysis of user industry, type, holiday, business status, etc, the predictive model continuously self-improves and corrects based on historical data and future trends, dynamically adjusts the predicted algorithm parameters, and realizes self-evolution. The big data SaaS product achieves complete data governance and has complete automated data management capabilities, and automatically repairs the abnormal data and error data of electricity sales according to the rules and trends of electricity consumption, and provides external data sources such as weather, regional economic indicators, and enterprises. The SaaS product has build a library with more than 30 kinds of electricity sales forecasting algorithms and models with independent intellectual property rights, in addition to typical time series method, periodic coefficient method, cubic exponential smoothing, gray forecasting method, autoregressive differential moving average method, holiday analysis and forecasting algorithm, etc.